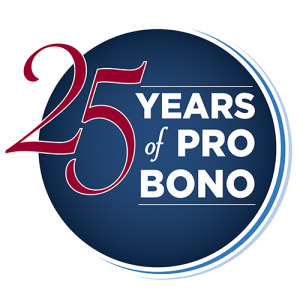 The overall theme of the 25th Anniversary is to show the ripple effect of the Pro Bono Program through the years and beyond, as well as across our community, state, nation and even world. It is also about the personal connection people have when they relate the knowledge they learned in the classroom to the real world problems of their communities. We turned to Pro Bono Board members from the past and as a result present to you these 25 videos and profiles. We believe they capture the spirit and impact of the Pro Bono Program and hope you will be inspired by the stories from these remarkable lawyers and will share with the next generation of advocates. This entry was posted in 25th Anniversary on 14 October 2014 by Pam Robinson.